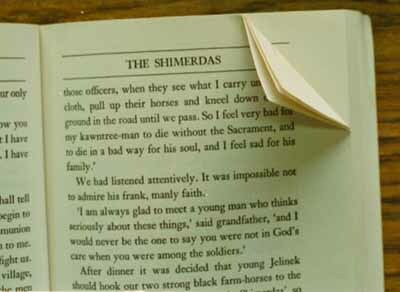 I have a confession to make that may make some of you extremely angry...I fold the corners of my books. When discussing this with a few of my friends, it transpired that many of them thought of this as a great sin. "But books should be kept looking perfect" they protested. Whilst I must admit that part of my reason for folding the corners over is that I'm too lazy to find a bookmark, there's a lot more to it than just that. Firstly, it's very practical. My bookmarks are always falling out, and there's nothing more annoying than that happening and losing your place. To those strange people who memorise what page they're on - I wish I had your memory, sadly that doesn't work for me. However, it's more than just practical reasons. I love the way that it looks. A dog eared book is clearly one that's been well read and loved. I especially love folding the corners over pages which have interesting quotes so when you come back to it you can remember the things that made that book special to you. A book in perfect condition to me signifies one that's been sat on my shelf and never read. In fact, I take it further than just folding the corners. I've dropped books in the bath, highlighted passages, left chocolate stains on the pages...the list goes on. Some of my books even have ripped pages. These books are the ones that look the best to me. Maybe they don't look neat and tidy, but they look well loved, and that, in my opinion, is the most beautiful a book can look. What about you? Do you like books to look exactly as they did when you brought them, or do you like them better when they're slightly battered?